A significant number of purchasers described the Brooks Glycerin 16 as a “very comfortable’ running shoe. Many people noted that the shoe feels true to size. A lot of testers welcomed the shoe’s new upper; they mentioned that it looks nice and stylish. Several purchased loved the lightweight design of the Glycerin 16. Those who have tried the shoe admired the upper unit’s breathable coverage. The shoe needs no break-in period, said some happy runners. Some users have taken note of the shoe’s sock-like fit and stretchy upper. More than a handful of users mentioned that the cushioning of the shoe is great for long-distance running. The Brooks Glycerin 16 is slightly expensive. A few users found the cushioning to be too soft for their liking. 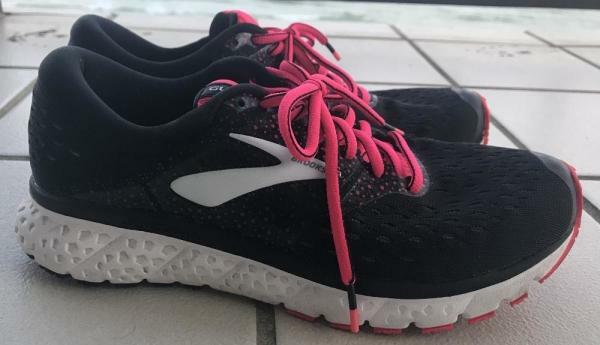 The 16th iteration of the Brooks Glycerin gained overwhelming positive feedback from its users, with special notes on its responsive cushioning, stylish design, and overall fit. Many attested to its impressive performance, but others found the price a bit pricey. Overall, the Brooks Glycerin 16 is indeed a fantastic road shoe for neutral runners. This review will be a close examination and a full 50-mile road test of the new Brooks Glycerin 16; conducted by me along the hilly roads and trails of Southern Indiana. This Brooks model is a premium quality neutral-Cushioned category shoe that can be favorably compared with such well-known industry standards as the Nike Vomero, and the Asics Gel Nimbus. Brooks Sports, Inc. was founded in 1914, by Mr. Morris Goldenberg, in Philadelphia, Pennsylvania. Today the company has a very dedicated worldwide following of mostly runners and, is headquartered in Seattle, Washington, U.S.A. The outsole is likely the only major component of this latest Glycerin to remain unchanged. This outsole has a high quality blown rubber and HPR Plus rubber in high abrasion areas for durability, a formula that has worked very well for years. Deep flex grooves allow for excellent flexibility, while the full-length ground contact assures a smooth and quiet transition from landing to toe-off. However, it is still not as quiet as the all-time champion of quiet-running, the Brooks Ghost. Brooks is well known for outsole durability and, outsole wear is not an issue with this shoe. As with the rest of the Brooks models, these shoes are quite durable. Additionally, this model has excellent traction on both wet and dry pavement. This version of the Glycerin uses the new DNA Loft foam. This foam is a blend of EVA (ethylene-vinyl acetate) rubber and air and is said to offer better cushioning and greater durability over earlier versions. This year's version of midsole does seem to be a little more responsive and, is slightly more cushioned, at the cost of only a tiny weight gain. The model 16 features a newly designed Jacquard mesh and, 3D printed overlays. An adaptable and stretchy foot wrap is also present and, wraps over the top and then down around the midfoot, which does help to secure your foot within the shoe as you run. The collar and tongue are typical Glycerin plush; with the lace, loop reverting to a more traditional location in the center of the tongue and, they have abandoned the offset lace stay, which is good. There is now a full-length internal liner, often referred to as a bootie. To my surprise, it really works and, seems to encourage running without socks. The Glycerin 15 contained only a half bootie. Jacquard fabric has the pattern incorporated directly into the weave; instead of being printed or dyed onto the material. The loom allows for a more versatile weaving process. The term “Jacquard” comes from the inventor of the loom attachment that makes this process possible: Joseph Marie Jacquard. I have been critical of Brooks’s lack of quality over the past few years. This was based mostly on minor cosmetic issues. You see, I am indeed picky and, why not? Anyone paying top price for something that likely won't be around after a single year’s use deserves to be. I could not find any quality issues to tell you about on these shoes, the materials and workmanship are simply great. Right out of the box, one could see that this was going to be a very comfortable and luxurious shoe. If you have had experience with earlier versions of the Glycerin you know, immediately, that you are in for a smooth ride. This is the Cadillac or Jaguar of running shoes. With the use of an internal bootie all the way to the toe and, a lack of stitched overlays that would rub your feet, this new Glycerin is totally comfortable. So comfortable, that I have even made a habit of running without socks in these shoes. These shoes feel light, despite a scale reading of 362 grams. I think there may be a little more bounce in the new version 16 than last year's 15; I have both versions, so I am able to compare closely. The welcomed flexibility helps provide a nice and quiet transition from heel to toe or, midfoot to toe-off, making running a little easier by not having to overcome the stiffness of the shoe. Surprisingly, with so many changes being made to this version, the Glycerin 16 still felt very much like the previous version. Brooks’s engineers have managed to almost totally change everything on this new model and, did so without noticeably changing any of the performance parameters. This shoe is a little heavier than last year’s model but, this was not an issue for me as I did not have to engage in any Olympic sprints during the entire course of this review. It is exactly as the designers intended, smooth and soft, even while cruising down the boulevard or, in my case, by the Southern Indiana cornfields. These shoes are best suited for the long run, or recovery run, making them great half or full marathon shoes; as long as you are not attempting a world record within the highest levels of competition. This shoe also should find wide acceptance among some older runners, as the natural padding on the bottom of their feet is frequently less than when they were younger; this new Glycerin could even help make them younger…well, sort of. Overall, Brooks has done an outstanding job; the fit and the finish are excellent. This is an example of what Brooks can do with quality control, and should do, with all of their models. If you are accustomed to a full-size road shoe, you won't mind these, and you get very plush comfort as a bonus. However, if you want something within the excellent Brooks lineup, but with more response and road feel; I would look at the Ghost or Launch, as it is both flexible and durable as well. Safety features have improved, somewhat. Thank you, Brooks! There are some very effective reflective bits distributed on the heels that wrap around both sides. And, these small reflective areas are very effective after dark; 360-degree coverage would have been even better. But in the end, we must take safety into our own hands. Remember, always run defensively, and trust in your own senses. This may seem like a rather odd couple of shoes that I have chosen for comparison but, these two "super models" actually have quite a lot in common. First, the Adidas is heavier than it looks, at 336 grams and, the Brooks is lighter than it looks, at 360 grams. Actually, they are within 24 grams of each other, both models are just a bit overweight. Both models roll down the road smooth and quiet. Basically, the Adidas is lighter, more responsive, has excellent cushioning and, should prove to be more durable with its advanced BOOST cushioning and Continental outsole. The Bavarian shoe makers got us on this one, way to go Adidas! The lines between the stability, neutral, and motion control categories are becoming more blurred every year. I now bravely step forward to compare the Nike Structure (stability) and, the Brooks Glycerin (neutral). The Nike Structure 21 is a stability shoe and, even while being compared to the premier cushioned Brooks Glycerin 16, I found the Nike to be lighter, more responsive and, about as well cushioned. In addition, it is faster, more fun, and less expensive. Actual weight comparison is Nike: 318 grams or, 42 grams lighter than the Glycerin 16. The Brooks has a slight edge is cushioning softness, but the Nike leads on speed, responsiveness, and fun by a wide margin. Way to go...out there in Oregon! Size Tested 12 D. 11 U.K. 46 E.U. Heel to Toe Drop 10 mm. ✖ Outdone by a 22-year-old Nike design! the version 15 and, I am far from being a “big” guy, as I am less than 150 lbs. 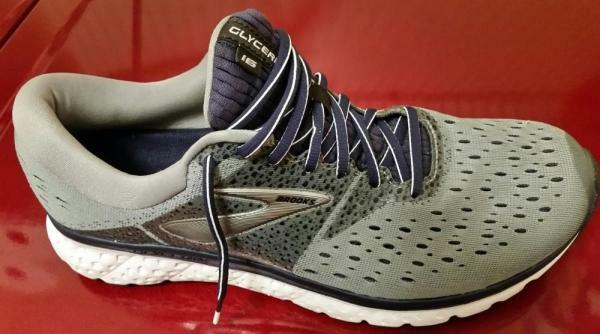 If I had to run a half or full marathon tomorrow morning, I would look at all of my shoes, bend them, think about them, and then likely head out the door in the Brooks Glycerin 16. Only because I have already sent the Nike Structure 21 to Africa; something I do on a regular basis, to help an orphanage in Tanzania. One more thing…While in the store, consider trying on the Brooks Ghost. The Ghost and the Glycerin are very closely related, buying the Ghost, however, should save you some beer money. Thanks for reading. Now…Let's Run! The long wait is over! Brooks had finally released the lightweight, responsive, and a livelier running experience. The shoe features a new design and innovative technologies to make every step plushy and lively. The upper of the Brooks Glycerin 16 is made up of a double jacquard mesh which is designed for breathability and comfort. The mesh is flexible enough which wraps the foot snugly, and the 3D Fit Print technology enhances the overall fit of the shoe. In the midsole is the DNA Loft. It is a new midsole technology from Brooks which replaces the old DNA foam found in the old version of the Glycerin. The DNA Loft offers a softer and responsive cushioning. In the outsole is the HPR Plus material designed for durability and traction. The Omega Flex Grooves in the outsole also gives flexibility without compromising the underfoot protection. The Brooks Glycerin 16 is a very comfortable road running shoe. The upper is very breathable - thanks to the jacquard mesh with plenty of perforations. The internal fabric is very smooth as well, giving the foot a very soft environment. The performance of the Glycerin 16 is truly impressive. I love the cushioning; it is very soft, durable and responsive. Running is effortless indeed with this road running shoe. Also, the performance of the midsole stays the same even after several miles. As impressive as the cushioning, the traction is also dependable. I have been wearing the shoe for diverse types of road surfaces, and the grip is remarkable, even on slightly wet and slippery surfaces. The flexibility of the Brooks Glycerin 16 is also noteworthy. Just like the Glycerin 15, the 16th version is flexible as expected. The Omega Flex Grooves did an excellent job in delivering the much-needed flexibility for a smoother run. Runners who are planning to buy this shoe should take note that it runs small. To get the right fit, one should consider going a half-size larger. I bought half-size up, and it did solve the issues I had with the fit. By getting the right size, you can absolutely experience a snug fit, from the heel to the forefoot. The upper mesh is stretchable, so it wraps the foot comfortably without the tight feeling. The toe box is also spacious enough for the toes to splay during toe-off. I am an Asics fan when it comes to durability. But when I tried this running shoe from Brooks, I now have another favorite. The Brooks Glycerin 16 is very durable - from the upper material to the outer sole. I am amazed by how the HPR Plus material works and how sturdy the jacquard mesh is. I really love the Brooks Glycerin 16. It gave me everything I need. The comfort is there, the responsive cushioning is impressive, and the structure is very durable. Yes, this shoe is really awesome. I am so excited to provide a review of long-loved, neutral running shoe. To begin, this was my first time running in the Brooks Glycerin; however, I have multiple running friends that only run in the Glycerin style, and I have run in other Brooks styles in the past including The Ghost, Levitate, and Revel. So, while this was my first time trying this shoe, I am very familiar with the brand. My favorite features about the Glycerin 16 are the mesh upper and internal stretch bootie. From the moment I put my feet in these shoes, they were surrounded by comfort. In fact, I have never had a shoe with a more comfortable upper in my life. The stretch in the upper mesh and bootie make the shoes very flexible. In return, this feature provides the shoes with the ability to mold to various foot types of different runners, giving everyone a comfortable ride. The tongue and upper heel on the shoe are softly padded, and you never have to worry about rubbing. The upper mesh is also breathable, and the bootie lining secures your foot in place! This makes them an ideal running shoe for summer months. No matter how sweaty you may get, your feet are guaranteed to stay in place. The Glycerin 16 is a lightweight running shoe weighing in at only 9.4 ounces. This alone makes these shoes perfect for long runs and speed work outs. While running in these shoes, I had no issue with the weight at all. This was a welcomed surprise when I ran in the Brooks Levitate (which weighs 9.7 ounces) because I felt like they were very heavy on my feet. Another feature of the updated model that I feel like is worth mentioning is the toe box – it is smaller compared to other Brooks models and previous Glycerin styles. For years the wider toe box was something that turned me off to Brooks shoes because I felt like my foot never properly fit in the shoe. However, for runners who enjoyed the larger toe box that may be an upgrade that you dislike. Also, I noticed that in this style the color schemes offered were much darker colors, versus some of the vibrant colors offered in previous versions of the Glycerin. I understand most runners pick shoes for comfort, but if you are looking for some blues, pinks, and purple shoes to brighten your feet you won’t find those in this version. Although these are advertised as a neutral shoe, they are designed with Brooks brand new DNA loft full-length midsole cushioning. This cushion is designed to offer runners a cushioned and responsive ride. I must admit, when I first started running in these shoes I did feel the cushion, but I didn’t feel like it absorbed as well as I expected. In fact, the cushion is not bulky at all as one might first assume. Additionally, I felt like the responsiveness was lacking in the beginning, when compared to other shoe brands I enjoy running in such as the Saucony Triumph. However, after giving them some time I feel like I was able to adapt to their ride even with my initial expectations. Therefore, my best advice would be to give these shoes some time and not make your first run in them your final opinion. There is only one true disadvantage that I see with these shoes and that is some individuals might find the price a little steep. They retail for $150.00 which may not be feasible for some runners. I feel like that may influence previous Glycerin runners to buy another pair the Glycerin 15 model while it is on sale, versus going ahead and purchasing the update. However, one thing I have learned about runners is they are normally loyal to their brand and with Brooks, there is the 90-day trial on all their gear so you can’t really go wrong on purchasing an updated model. To conclude, I have enjoyed testing the Glycerin 16. I have found these shoes to be lightweight and to have upper comfort unmatched by any shoes that I have tried. I believe that any runner searching for a neutral running shoe would find the cushion and responsiveness beneficial. Additionally, the variety of color choices and design make these shoes appealing to a wide range of consumers. Lastly, Brooks is a trusted brand among runners and, as I mentioned before, stands behind its gear with a money back guarantee. Designed for road running, the Brooks Glycerin 16 is a successful release. The shoe features several updates to make running more responsive and comfortable. The shoe uses a new upper material for a more breathable coverage, and the new DNA Loft midsole foam offers long-lasting cushioning. Jacquard Mesh – A double layer mesh which offers breathable coverage. It offers added structural support and adaptable flexibility. 3D Fit Print - It has an internal bootie design for a smooth in-shoe feel. DNA Loft – A new foam extended in the entire midsole for durable cushioning. It offers long-lasting responsiveness and flexibility. HPR Plus – A rubber outsole material specifically placed in the heel area for durability and added traction. Blown Rubber – A rubber compound placed in the forefoot area for durability, flexibility and added responsiveness. Omega Flex Grooves – It offers flexibility for a more natural and painless running experience. IDEAL Pressure Zones – It is designed to evenly distribute pressure, from the heel to the forefoot. The Brooks Glycerin 16 performs fairly on the roads. It has a good amount of cushioning, but the traction is less reliable when stepping on wet or slippery surfaces. The new DNA Loft midsole is not too soft and not too firm. Based on my preferences, the cushioning is just right. It is responsive and bouncy enough to survive long-distance runs. The Glycerin 16 has a standard running shoe size; it fits true to size. The fit, from the heel to the forefoot, is impressive. I love the fact that it does not create any pressure on my foot. The toe box has plenty of wiggle room as well. I also admire the padded tongue and collar; they enhance midfoot and heel security. I must admit, Brooks is a reliable brand when it comes to durable shoes. This particular version is very durable, as durable as the old Brooks Glycerin 15. The materials from the upper to the outer sole are of high quality. After running more than 100 miles, it has not shown any sign of wear and tear. When it comes to comfort and breathability, Brooks Glycerin 16 stays true to one of its promises – to deliver a comfortable in-shoe feel. The shoe has a new upper, and impressively, it still delivers a good amount of breathability. There are perforations in the upper, and the stretchy material wraps the foot comfortably. The new midsole foam also offers comfortable underfoot protection. I love the overall performance of the Brooks Glycerin 16 but, it is not my favorite. I mean I love the shoe’s cushioning and durable design, but it is expensive and less grippy on some surfaces. Honestly, I can get a few Asics running shoes at the same level or better performance at a much lower price. In summary, I still recommend this road running shoe for runners who are willing to buy an expensive shoe. The new Brooks Glycerin 16 features a redesigned upper and new midsole technology. It aims to provide runners with better running experience without adding too much weight. One of the significant updates on the Glycerin 16 is the midsole technology. The new DNA Loft midsole replaces the old Super DNA cushioning. The DNA Loft is specifically designed to deliver a more responsive and softer ride. The upper of this Brooks shoe has also gone through a significant update. It now uses a jacquard mesh material for breathability and the stretchy 3D Fit Print technology delivers enhanced fit. The Brooks Glycerin 16, just like the Launch 6, is designed to be true to size, and it can accommodate a wide range of foot measurements. It has a standard medium fit in the heel and forefoot area. The toe box is also roomy enough for the toes to spread-out comfortable. Women’s Brooks Glycerin 16 have three width options (AA - Narrow, B - Medium, D – Wide) while Brooks Glycerin 16 for men have two (D - Medium, 2E – Wide). The outsole of the Brooks Glycerin 16 uses two rubber materials – the HPR Plus and blown rubber. The HPR Plus is a more durable rubber material placed in the heel. It protects the outer sole from abrasion. It also gives added traction on a variety of surfaces. The blown rubber, on the other hand, is placed in the forefoot area. It aims to deliver flexibility and traction. Being soft and bouncy, it also gives added underfoot cushioning. The notable Ideal Pressure Zones is also present in the Glycerin 16. It aims to disperse pressure proficiently for a more effortless and smoother ride. The new DNA Loft cushioning is integrated into the midsole of the Brooks Glycerin 16. This midsole technology is made from DNA foam, rubber, and air. The compound aims to provide a soft and comfortable cushioning while maintaining the bounce and durability at the maximum level. With the new DNA Loft, a smoother heel-to-toe transition can also be expected. The DNA Loft is the latest midsole innovation from Brooks and it is first introduced in the Glycerin 16. The Brooks Glycerin 16 uses a double jacquard mesh in its upper. The mesh offers breathability, and it stretches according to the shape of the foot, giving it a very comfortable coverage. Attached to the mesh is the 3D Fit Print Technology which enhances the overall fit of the shoe. It offers a better midfoot security without having the fit too constricting and painful. The shoe also has an internal bootie construction which provides the foot a softer in-shoe feel. It offers an irritation-free environment for the foot. The Glycerin 16 also features a traditional lace-up closure which effectively delivers midfoot security and comfortable foot lock-down. The 16th version of the Brooks Glycerin features a redesigned upper and a new midsole foam. It retains the same outsole material and design to deliver the same amount of traction and durability. Based on the reviews made by professional and casual runners, the Glycerin 16 has proven to be a successful release. It upholds the model’s legacy to deliver a comfortable, smooth, and bouncy ride. The brand has tightened up the overall fit of the Brooks Glycerin 16. Compared to the previous version, the Glycerin 16 now has a much tighter yet comfortable fit in the heel, midfoot and forefoot. The Glycerin 15 has a wide toebox but since the latest version has a very flexible mesh upper, wide-footed runners won’t have any problem wearing the shoe. Both versions are true to size and are available in narrow, medium, and wide widths for men and women. The aim of the Brooks Glycerin 16 is to give runners a smoother and luxurious stride. True enough, the shoe offers a softer underfoot cushioning, and it is lighter than the old DNA Midsole. Staying true to its promise, the Glycerin 16 feels fast and the transition is very smooth. The newest iteration of the Glycerin has a less structured midsole. It lacks the arch support it showed in the 15th version. But despite this, the Glycerin 16 remains to be a reliable running shoe for neutral runners. The shoe is designed for road running. The design of the outsole offers enough amount of grip on varied paved surfaces; it does not slip even on wet surfaces. There are also flex grooves in the outer sole, which are strategically designed for enhanced flexibility. Overall, the Brooks Glycerin 16 has shown impressive performance on the road. The balanced and soft cushioning offers responsiveness and smoother heel-to-toe transition. The Glycerin model is slightly expensive, but it continuously makes most runners happy because of its premium quality. Just like the older versions of the Glycerin, the 16th iteration delivers the same level of quality; it is as durable as the 15th version. Based on some user reviews, after several miles of running, the shoe shows no significant wear. The outsole remains intact, the midsole performs consistently and the upper is sturdy enough to withstand the damaging elements of the roads. Compared to the Glycerin 15, the latest version is more breathable and comfortable. The upper makes use of a double jacquard mesh and this material delivers flexibility and breathability. It wraps the foot comfortably, and the internal bootie construction delivers an irritation-free environment. When it comes to the looks, the Brooks Glycerin 16 has a more eye-catching design and color options. It is not bulky and has a versatile look that it can be worn on casual days. Both the Brooks Glycerin 16 for men and women are flexible enough to be paired with light and dark-colored shorts and pants. The Altra Escalante 1.5 is a lightweight road running shoe designed for neutral runners. Aside from the fully-cushioned Zero Drop midsole, the shoe also features a few innovative technologies from Altra. It uses FootPodTM technology, InnerFLEX, and FootShape toe-box. The Escalante is not as soft as the Glycerin 16. But its cushioning is enough to give runners a comfortable ride, mile after mile. It also has a breathable upper, comfortable fit, and reliable traction. The Escalante 1.5 is more affordable, and the shoe also received several positive comments from running enthusiasts. Just like the Glycerin 16, the Pegasus 35 has gained positive feedback from runners. Known as the longest-running sports shoe from Nike, the Pegasus 35 continues to deliver comfort, responsiveness, durability, and flexibility. The Pegasus 35 is as bouncy and springy as the Brooks Glycerin 16. It also has a breathable upper coverage and comfortable fit, from the heel to the forefoot. With the performance of this Nike running shoe on the roads, Glycerin fans will surely find satisfaction in the Air Zoom Pegasus 35. A versatile running shoe, the Adidas Duramo 9 aims to give the users a well-cushioned and flexible ride. It features the Cloudfoam midsole for superior and comfortable cushioning. It also makes use of the Adiwear outsole material that gives the shoe durability without compromising traction. Just like the Brooks Glycerin 16, the Duramo 9 offers a soft and responsive cushioning. It gives the foot breathable coverage and offers a smooth in-shoe feel. Overall, the performance of the Duramo 9 is comparable to the Glycerin 16, but this Adidas running shoe is more affordable and more stylish. Is it worth it to purchase the Glycerin 16? The Glycerin 16 is one of the expensive running shoes from Brooks. Beginners might wonder if it is really worth it to purchase this latest version. If you are a runner who is looking for durable, high performing, and comfortable shoe, then yes. But, if you are a budget-conscious runner, then you should try something else. You will surely find affordable options online. You can also try searching for the older version because it is usually sold at discounted rates. The Brooks Glycerin 15 is not a bad version. Other affordable options are the Ghost, Ricochet and the Launch models. In the first half of 2018, Brooks unveils the brand’s softest cushioning material ever, the new DNA Loft midsole technology. This innovation was first introduced in the updated Brooks Glycerin 16. The DNA Loft is made of rubber, air, and Ethylene-vinyl acetate (EVA). Built to be lightweight and soft, it continues to deliver the qualities from the brand’s signature DNA midsole. It is plush and protective. It adapts to the running style of every runner, and it provides a softer and faster feel. This new midsole foam is used in other Brooks running shoe collections like the Ghost, Levitate, and Ricochet. Brooks will continue to show support and inspire runners by having partnerships with various running events like 5K races and marathons. In every event sponsored by Brooks, expect to see a Brooks booth. The booth serves as the runner support center where you can find various running items like shoes, sports bras, and apparel. They cheer for the runners. Cheer stations are available in all events sponsored by Brooks. In the cheering zone, you’ll hear some pumping music and you’ll see people smiling and waving.